I just returned from a lean management ranting gig in Greenville, South Carolina – an incredibly beautiful part of the country, chock full of folks pursuing lean very aggressively I might add – and had a chance to swing by Fort Bragg in Fayetteville, NC on my way back. The detour to Bragg was to see my son graduate from NCO Leadership School before he starts a deployment to Iraq next month as a sergeant with the 82nd Airborne. By coincidence, both Kevin and John Kerry chose leadership as the hot topic this week, so I thought I’d add my two cents worth from lessons I picked up from the NCOs. No one is more professional than I.
I … will at all times conduct myself so as to bring credit upon the Corps, the Military Service and my country regardless of the situation in which I find myself. I will not use my grade or position to attain pleasure, profit, or personal safety. Competence is my watchword. My two basic responsibilities will always be uppermost in my mind — accomplishment of my mission and the welfare of my soldiers. All soldiers are entitled to outstanding leadership; I will provide that leadership. I know my soldiers and I will always place their needs above my own. I will communicate consistently with my soldiers and never leave them uninformed. I will be fair and impartial when recommending both rewards and punishment. In pondering the irony of it all, I am quite proud of the fact that my son is not clever enough to see his role as one of belittling and abusing people a la Jack Welch; or declaring each unit success to be completely his own doing as the ‘grab the stock options and run’ gang does; or to see leadership as a validation of self-importance like Bob Lutz. The NCOs have a very clear understanding that their reward is limited to the extra couple hundred bucks in their paycheck each month and the pride they can take from their accomplishment. Anything they seek beyond that is a failure of leadership. I think that a business leader who decides that he is not clever enough to understand all of the leadership guruism and settles for the leadership principles of those too dumb to support John Kerry just might do pretty well. Competence strikes me as a pretty good watchword. Thanks for sharing an example of TRUE leadership, something we find all too rarely in business or politics. Best wishes to your son, Bill. Thanks, Mark. I’m sure he’ll be fine. 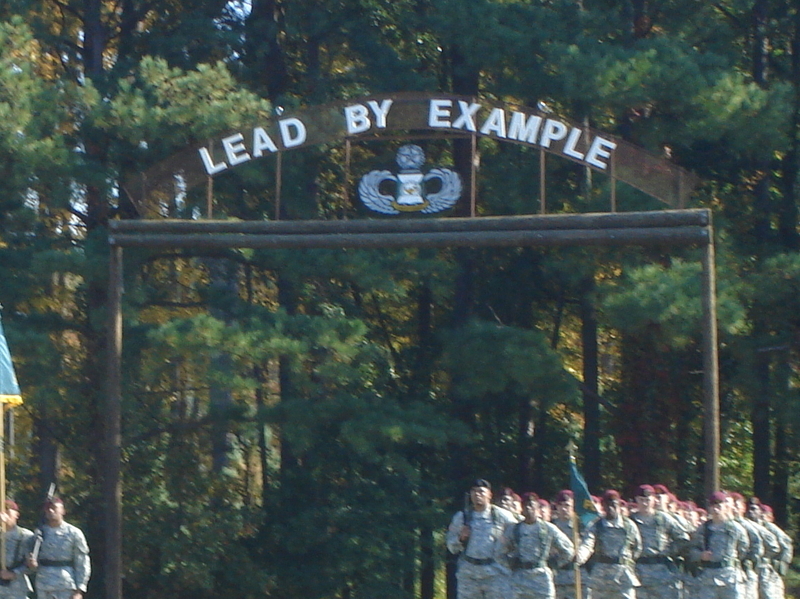 I was really struck by the Army’s definition of leadership revolving around selflessness. Leadership is measured by what a man gives – not what he takes. That is in such sharp contrast with what passes for leadership in most manufacturing circles these days. It’s not just manufacturing…. it’s all about “me me me” in politics and most business, it seems. It’s so refreshing to see when a company is built around service to others and treating their employees with respect. You’d think that with those principles being so rare that there’s a real “competitive advantage” (ugh, MBA speak) for companies that choose to operate that way.